Who ripped Arabella’s spirit from her body? Arabella’s wandering around looking for her friends in a not-so-nice part of town, when Trey comes to her rescue. While she’s assuming that he’s there to help her navigate her way to safety, he’s actually drawn to her because she’s a ghost. The kind of ghost that can turn horrific, sprout nasty fangs, and rip into the living with a vengeance… Trey is drawn to help the young woman, recognizing that not only is she gently bred and naïve to wander into this part of town, but she has no clue that she’s dead. As Trey soon discovers, Arabella’s not quite dead, and yet her spirit is blocked from returning to her comatose body. Trey has a limited amount of time to return Arabella to her body before her fragile bond dissolves or she is exorcized. There are evil forces at work and Arabella’s spiritual dilemma is just part of a much larger world-destroying conspiracy. Can Arabella and Trey solve the mystery in time to stop the plot’s culmination? The character-building is wonderful, the world-building is interesting, and the storyline is nicely done. 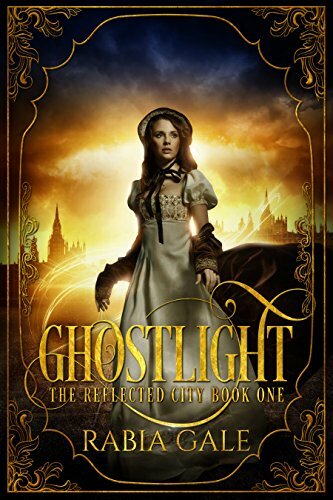 Overall, Ghostlight (The Reflected City Book 1) is a very enjoyable fresh, fun read. I’ll definitely be reading the next book and trying out other titles by this author. Highly recommended. Trevelyan Shield would rather fight demons and exorcise haunts than deal with debutantes, alive or dead. But when he encounters the charming but ghostly Arabella Trent, his duty is clear: send the young woman into the afterlife. Otherwise, she risks attracting the denizens of the Shadow Lands, who hunger for mortal souls. Arabella doesn’t remember the runaway carriage that hit her and left her for dead. Nor does she know why her body was found so far from her. But something—or someone—is preventing her from returning to it, and she’s determined to find out why.